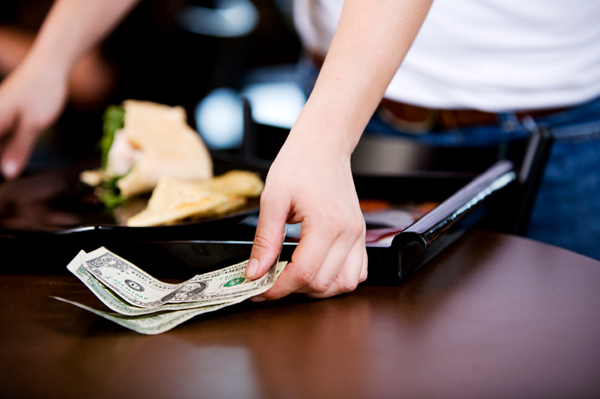 Restaurants, spas and hotels are just a few places that require you to leave a tip. But how much do you leave and who do you give slip a couple bucks to? To help you navigate your way through the service industry, we’ve complied a list of standard gratuity rates. The general rule for tipping servers is 15 to 20 percent of the total bill, keeping in mind that the average gratuity being 18 percent. If you’re having drinks at the bar, you should give your bartender 15 to 20 percent of your total bill as well, but if you’re just having one drink, leave your barkeep at least a dollar per cocktail. If you order takeout from a sit down restaurant, that doesn’t excuse you from tipping, so give the person who handled your order up to 10 percent. For counter workers at takeout and coffee places, the queen of etiquette, Emily Post, has said it’s not necessary to tip, but leaving your change is pretty standard. If you’re a regular and your barista has your drink waiting for you, you should leave at least a dollar. Just like with restaurants, the average tip expected in a hair salon is 15 to 20 percent. If more than one person tends to your follicular needs, such one person to cut and one person to color your hair, you should split the total tip between them. If a different person washes your hair or rinses out the color, you should slip them 2 to 5 dollars. The 15 to 20 percent rule also applies when receiving a manicure or massage. Traveling is expensive enough without having to tip, but unfortunately it’s part of the package. It may seem like you are constantly doling out cash to someone, but they are providing you with a service, and you should factor it into your travel budget. 1 to 2 dollars per bag for the sky cab at the airport. 15 to 20 percent for taxi or limo drivers. A dollar a bag for the bellhop. A dollar for the doorman who hails your cab or retrieves your car. 15 to 20 percent of the bill for room service. 2 to 5 dollars a day for housekeeping. 5 dollars for the concierge who makes a dinner reservation, 20 dollars if he/she gets you theatre tickets, and up to 25 dollars if they go above and beyond to meet your request. Two dollars seems to be the rule of thumb for a standard wash, but if you have a larger vehicle, such as an SUV, you should consider giving 3 to 5 dollars. When having your car detailed, flip them 15 percent of the cost. For one time parking, the standard tip is 2 to 5 dollars. If you valet, you should tip the person who brings you your car and not the one who takes it away. The average tip for getting your pet groomed is 5 to 15 dollars, unless of course you have a large, shaggy or high maintenance animal, then you should kick in a few extra bucks. The above amounts are just a set of guidelines for tipping the service industry. If you find your server, bartender or hair stylist has given you superior or inferior service, you should reflect that in your tip. Start with the standard rate and adjust accordingly.